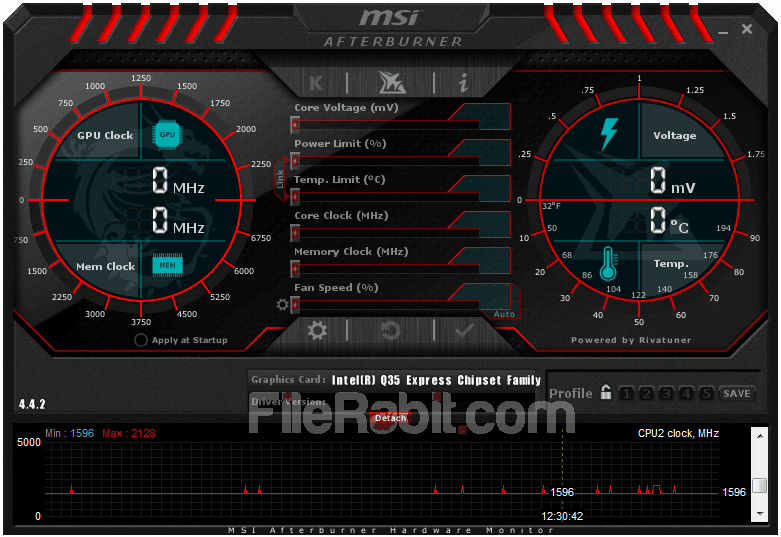 Adjust graphic cards, monitor fan speed and control GPU voltage of MSI Afterburner; improve and boost overall gaming performance with it’s advanced features. A perfect small and smart utility especially designed for gamers as well as movie mixing studios. When a computer will start lagging or hanging while working with a movie mixer or playing a game, it means 3D card is creating problems. It gives ultimate control over graphics card unit to handle its fan, heating system as well as voltage. Video recording is one of high memory consuming task where system will buffer each pixel at HD point. View everything in detailed information about GPU while benchmarking, video recording, movie mixing and video converting. Make personal profiles and customize them with changing fan speed, voltage, memory consumption, quality of graphics and more. 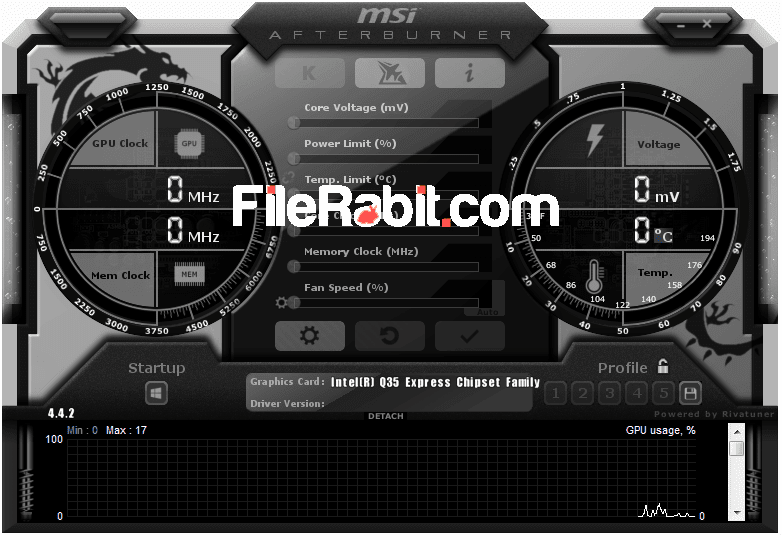 MSI is offering its after burner tool for all brands of GPU such as AMD (ATI), Intel or nVidia as well. It will work on all types of GPU cards from classic to latest 4th generation graphic units. Customizing a video card setting should be an advanced feature but will increase GPU performance so it will respond faster than ever before. High value of frames per second or FPS are good for online gaming community but the value can be customize with adjusting video resolution, blood, water, smoke, shadows and other texture effects. Customize the layout with dozens of colorful and attractive skins for free. More skins are available online that can be downloaded without any cost. Multilingual feature makes it popular among worldwide users. Major language support added into latest version so users from any country can use it without reading problems. 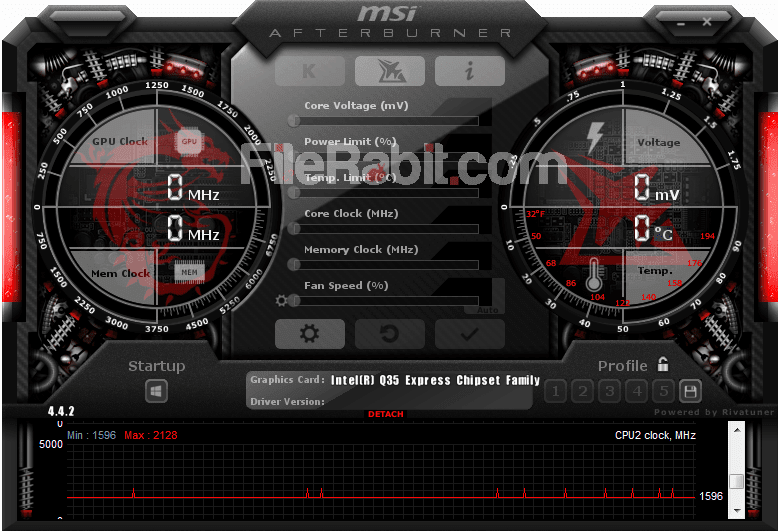 MSI Afterburner has its own FPS counter that will work only inside gameplay. The information provided in FPS counter is located on corner of monitor screen and the FPS value is a real-time value. FPS can be increased or decreased through customizing GPU settings, lower setting will give higher FPS with stable value but higher video quality settings should decrease it to red level. 64 bit support is added for x64 based operating systems and 64-bit modern motherboard PC’s. However, fan speed profile creating will keep the GPU temperature at normal cooling. Core, memory and aux voltage can be controlled with customizing the value in between min to max.